Famous for its legendary Cubase music production software, Steinberg has now set its sights on the entry-level market with the introduction of Sequel. This new package is in direct competition with the likes of the well-established Magix Music Studio. So, the big question is whether there's enough Steinberg magic in Sequel to make it worth the extra £25. Like Magix Music Studio, Sequel gives you the opportunity to mix and match between built-in virtual instruments and live recording of MIDI versions, or electric and acoustic ones via line-in or microphone inputs, as well as vocals. Sequel's virtual instruments are excellent and there are no less than 600 to choose from. There's also a vast collection of some 5,000 ready-made loops catering for almost any musical style you can think of. One of Sequel's strong points is its Live Performance mode, which enables you to remix or combine whole songs on the fly, as well as individual tracks. For taking your music out into the big wild world, the program is also compatible with Macs as well as both Vista and XP PCs. You can save your finished mixes in CD quality, 16- or 24-bit enhanced quality WAV audio files, or even export them directly to iTunes, although strangely there's no MP3 export option. 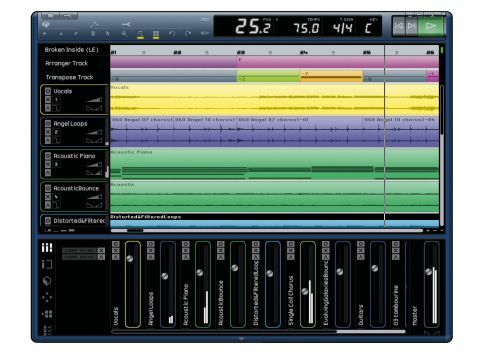 The interface is a little staid compared to the slightly more glitzy environment of Magix Music Studio, but Sequel is nevertheless quite intuitive with its collection of "zones" for accomplishing common tasks. Better still, you get a spectacular range of audio effects for applying globally or to individual tracks, as well as to separate instruments, which are based on the same technology built into Cubase. On top of effects such as chorus, flanger, phaser, reverb and so on, you can also adjust specific instrument parameters such as cut-off, resonance, attack and sustain. Deceptively straightforward in appearance, Sequel is a powerful program that'll appeal in equal measure to serious musicians and those with no musical ability or training whatsoever.